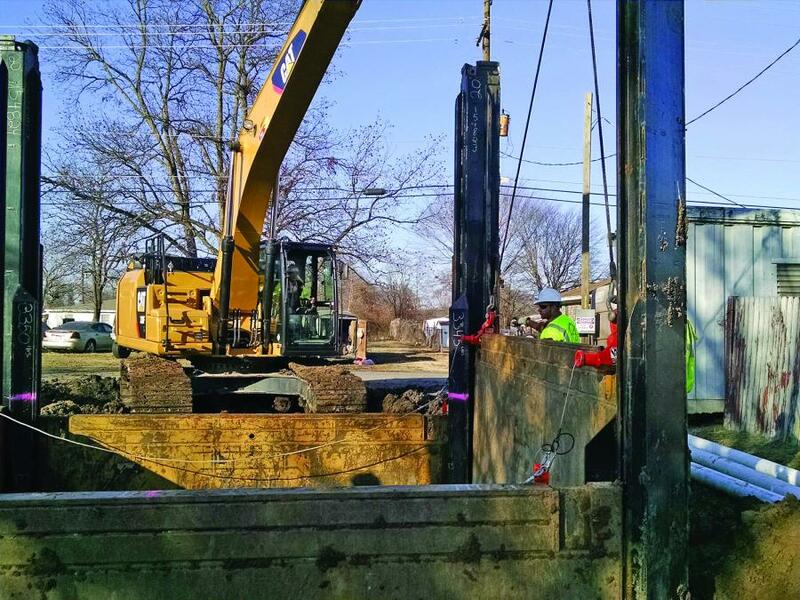 Recently, contractor RedStone Construction Group was low-bidder to install a sanitary sewer wet well for North Little Rock (Arkansas) Wastewater. 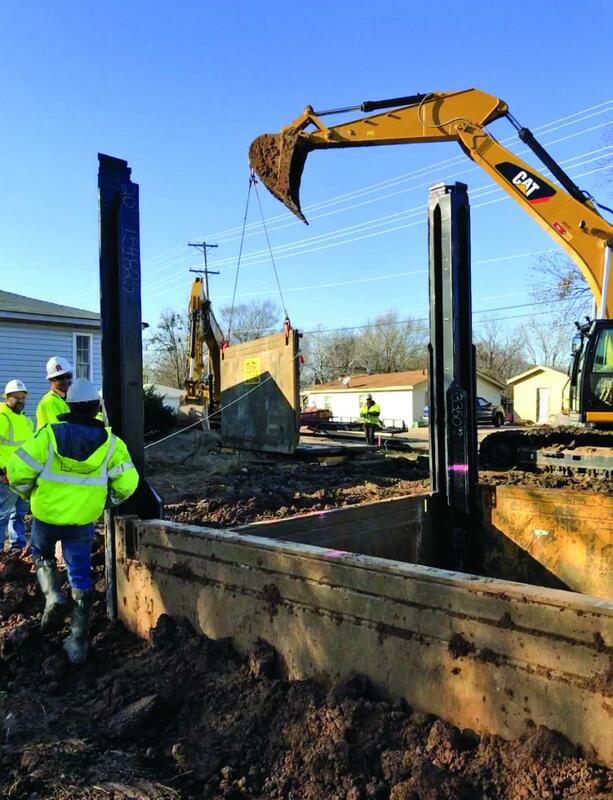 The 25 ft. tall, 8 ft. diameter fiberglass wet well was installed along 10th Street in North Little Rock. The installation of a pre-cast structure with sewer tie-in was really nothing new for RedStone. However, the depth of the excavation and its proximity to the Arkansas River presented a new wrinkle for the veteran underground utility crew. Plus, the excavation site was packed into a very small working area. “We only had about a 25 foot radius of space around where the wet-well was going to go, so we didn't have any room for sloping or benching,” said Kurt Cosse, RedStone's project supervisor. “We knew we needed some type of non-traditional shoring system that would allow us to minimize the impact of the excavation area,” he said. RedStone turned to local heavy equipment dealer Riggs CAT for possible solutions to its unique shoring challenge. Efficiency Production's universal slide rail system is a component shoring system comprised of steel panels — similar to trench shield sidewalls — and vertical steel posts. When installed, the versatile system creates a safe, obstruction-free shored excavation, according to the manufacturer. Both Cosse and Clark were very impressed with Efficiency's Shoring Specialist, Dan Meredith, who provided factory-direct installation assistance. Meredith is part of Efficiency Production's special operations shoring division. “It was great working with both Riggs CAT and RedStone, three different companies coming together for a common objective,” Meredith said. Clark said, “I observed how Dan worked with and handled the crew and I was very impressed with him. He interacted with RedStone's crew to make the slide rail go into the ground effectively and efficiently, but he also showed respect to those professionals that were there with Red Stone. It takes a special person to blend into a crew like that and Dan did that seamlessly,” Clark concluded. Slide Rail is installed by sliding the steel panels into integrated rails on vertical posts and then pushing the panels and posts incrementally down to grade as the pit is dug. RedStone rented from Riggs the slide rail equipment to shore a 14 by 14 ft. excavation, 20 ft. deep. It installed the system with a Cat 330F and Cat 323F excavators, plus a Cat frontloader. RedStone Construction Group has been serving Arkansas for more than 35 years, offering a wide range of services including excavation and earthwork, underground utilities, concrete and asphalt paving and repairs. For more information, visit www.redstone-cg.com. For more information about Riggs CAT, visit www.riggscat.com. For more information about Efficiency Production, visit www.efficiencyproduction.com.